I don't know. 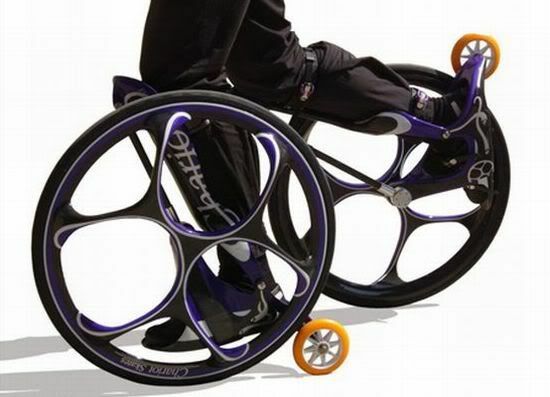 I'm not a skater or biker, so I can't really say much but the Wheel-skates from Chariot Skates look rather ridiculous and I don't know how much they'd really be an improvement over either. "....radical roller skates that seem to breach the gap and take skating closer to skiing and cycling. Finished in about 5.5 pounds (each skate) of carbon fiber, the skates roll smoother and provide better maneuverability, as if you’re skiing, in comparison to their conventional or even contemporary counterparts. Strapping your foot just below the axle of the (knee-high) main wheel, the Chariot skate also integrates a smaller wheel near your heel for extra support on rough terrains or grassy slopes." They're hugely impractical but they might be fun. Just for a change, yanno? Emily! Too lazy to change it, but not lazy enough to skip typing out an apology and explanation, lol. And yeah, Fairy, I think they could be fun....but I'm pretty sure I'd kill myself on 'em, too.